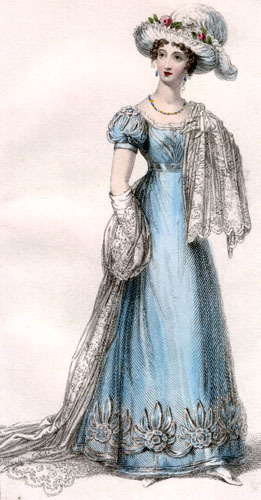 Dinner dress doesn't become a special type of dress in women's fashion journals until late in the Regency. Dinner dress is part of the general category of half dress, a semi-formal type of outfit worn from the afternoon into the early evening or for informal evening gatherings. Dinner Dress, 1824, from Rudolf Ackermann, The Repository of Arts, Literature, Commerce, Manufactures, Fashion, and Politics, 1809-1829. This dinner dress of pale blue is trimmed with bands of satin and satin buttons, roses, and rouleaux. The hat is of white crepe and has white damask roses around the brim. White ostrich feathers also trim the hat. The lady has a long lace scarf draped over one shoulder. Her necklace and earrings are turquoise to match the color of her dress. Left: Dinner Dress of 1 Feb. 1814 from John Bell's La Belle Assemblee, or Bell's Court and Fashionable Magazine Addressed Particularly to the Ladies, 1806-1868. The dress is in the pelisse style. The headress is a tocque, a sort of cross between a hat and a turban, usually with feathers on it. Above: Detail of dinner dress. Note: A kind person has written to tell me this may actually be the plate of a carriage dress in the Feb. 1814 issue. If so, that would explain why it looks like a pelisse!